Mary’s first batch of hats and scarves. Last month, I spent some quality time in Florida with family. This time, we were able to spend time together without the excuse of funerals – a nice change of pace from 2018. My cousin Mary and I were catching up on life since we last saw each other. Mary lost her mother (my Aunt Barbara) and one of her sisters (my cousin Karen) last year. As a result, Mary has become the de-facto matriarch of her family. It’s a responsibility that can weigh heavy. After last spring’s funerals, Mary created a goal for herself – create 100 hat/scarf sets for the homeless this past winter. This is a classic example of a SMART goal – measurable, a bit of a stretch, and attainable with careful marshaling of the resources she had available. Mary already knew the material requirements for each hat/scarf set. She had built them before for family members and friends. After purchasing multiple bolts of Polarfleece and other supplies, she broke down the process into discrete steps. Mary has rheumatoid arthritis, so once she broke down the process, she identified which steps would require a “good hand day” to complete. Mary began to execute the plan, creating the hats and scarves in batches. On “good hand days” she would take a batch of hats and scarves and put that batch through the step requiring a “good hand day,” then setting them aside for later. 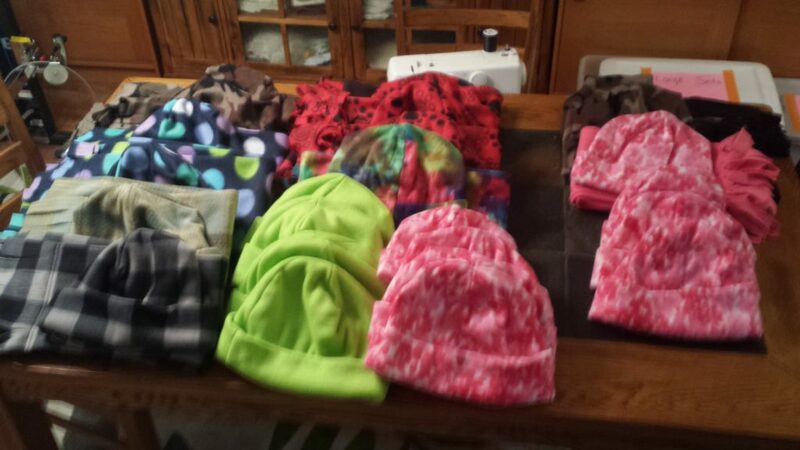 As a result of this batching process, she was able to create 50 hat/scarf sets for the homeless community this winter. Pretty impressive for less than 6 months of work and working around a chronic health issue. Mary’s example demonstrates the importance of task breakdowns and task analysis – especially when energy is unpredictably variable due to chronic illness. Mary then planned her process to take advantage of this variability. We tend not to consider variable resources and energy enough in our planning. Most of us assume we are going to have “good days” during the entire project. We all know that’s not going to be the case for 95% of us. Kids get sick, we get sick, some of us grapple with chronic illness, bad days happen. Thanks Mary for your example, support, and for being a willing guinea pig. I love you!